Gingrich Fights Against The Lobbyist Label Former House Speaker Newt Gingrich continues to fend off accusations that he should wear the scarlet "L" — for "lobbyist." He's released two consulting contracts and says they didn't call for any lobbying. But where's the line between consulting and lobbying? 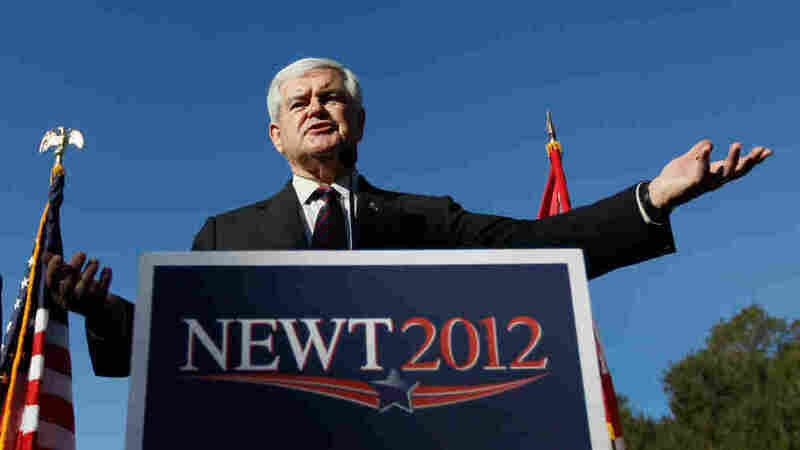 Explore the latest NPR coverage of GOP presidential candidate Newt Gingrich. Republican presidential candidate Newt Gingrich speaks Thursday during a Lakeside Inn Tea Party rally in Mount Dora, Fla. In the race for the Republican presidential nomination, former House Speaker Newt Gingrich continues to fend off accusations that he should wear the scarlet "L" — for "lobbyist." This week, he released two of his consulting contracts and said they didn't call for any lobbying. Like many other former lawmakers, Gingrich was advocating for paying clients, while not officially registering as a lobbyist. The two contracts disclosed this week came from Gingrich's work for Freddie Mac, the mortgage giant. Between 1999 and 2007, Freddie Mac paid his firm $1.6 million. The contracts say he was advising and discussing, not lobbying — at least not in the legal sense of the word. "There is no place in the contract that provides for lobbying. I have never done any lobbying," Gingrich said at a debate Monday night. Gingrich deliberately avoided registering as a lobbyist, which would make public his clients and their payments to him. There is no place in the contract that provides for lobbying. I have never done any lobbying. "In fact, we brought in an expert on lobbying law and trained all of our staff. And that expert is prepared to testify that he was brought in to say, 'Here is the bright line,' " Gingrich said. That expert is Thomas Susman, now the head lobbyist for the American Bar Association. He says his work for Gingrich is no secret. "He said that I could go public with my representation back when I first worked for him," Susman says. But Susman's version doesn't quite match Gingrich's. He's sure he gave Gingrich some advice about the federal lobbying law, but not enough that he remembers doing so. "I'm sure I would have, because that was what my expertise and involvement had been," he says. Besides, that really wasn't Gingrich's focus. "He was involved with a number of clients of his group at the state level, with state legislators and state officials. And that was where he was most concerned," Susman says. Gingrich is also defending his advocacy of the Medicare drug benefit known as Part D.
On Thursday, rival Mitt Romney's campaign brought out former New Hampshire Republican Rep. Jeb Bradley, who told reporters about a meeting with Gingrich before the congressional vote on Part D in 2003. "I'll tell you, that day that I met with Newt, he was lobbying," Bradley said. Gingrich says he promoted Part D as a citizen, not a paid lobbyist. He cited the need for better diabetes treatment as an example at Monday night's debate. "I publicly favored Medicare Part D for a practical reason. And that reason is simple: The U.S. government was not prepared to give people anything — insulin, for example — but they would pay for kidney dialysis," he said. But while Gingrich long supported the drug benefit, it's also true that Novo Nordisk, a company that specializes in diabetes treatment, was a $200,000-a-year member of his Center for Health Transformation. This stance of "do no lobbying" has defined Gingrich's post-Congress career. If he wants to be the first president who's a registered lobbyist, we'd love it. The assertion shows up on the website of the Center for Health Transformation and in one of the Freddie Mac contracts. But lobbyists rarely use the L word in their contracts. Susman remembers the so-called engagement letters used by his old law firm. "We'd use such terms as advocacy, including advice and counsel, including organizing. But probably not use the word lobbying in it," he says. Susman is active in a push to make the lobbying industry more transparent. So is political scientist James Thurber, who heads up an institute on lobbying at American University. Thurber says there should be disclosure by so-called senior advisers — the former lawmakers, like Gingrich, who don't formally register as lobbyists. "They don't have to be called lobbyists, but let's find out who they are," Thurber says. And even some lobbyists want more transparency for their industry. An association called the American League of Lobbyists is working on a reform proposal. The league's president, Howard Marlowe, says he wishes Gingrich wouldn't run away from the profession. "If he wants to be the first president who's a registered lobbyist, we'd love it," Marlowe says. But for now, Gingrich and other politicians seem pretty sure that a registered lobbyist is about the last candidate voters would want.